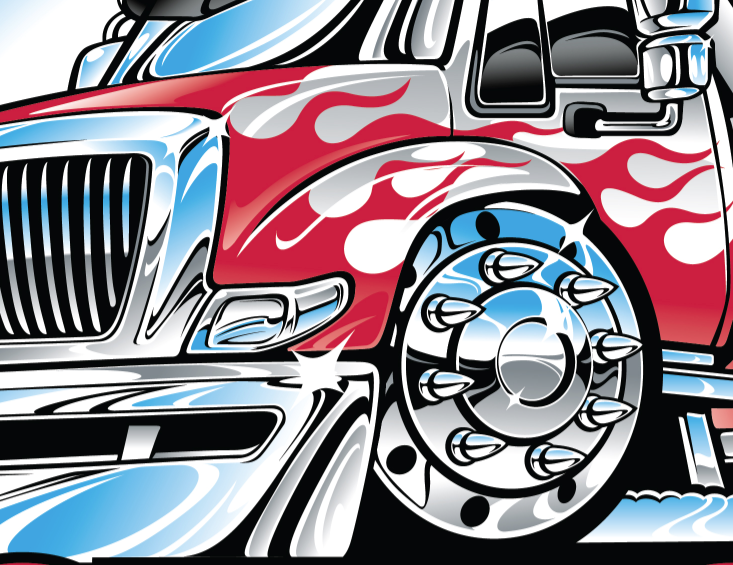 Recently the good folks at TowTimes Magazine Online – www.towtimes.com – contacted me about creating a Medium Duty Tow Truck Cartoon for an upcoming Tow Show t-shirt. Honestly I do enjoy creating these fun caricatures of so of course I said YES and it was on to the concept stage using a photo they provided. Here is where I rough out angle, loose details, and start marinating on the overall layout of the t-shirt. I use Photoshop with the super-awesome Frenden Photoshop Brushes to start this process. To you purists – YES, I do know how to use a pencil – however right now I do not have the desk space for our scanner, and I actually enjoy the flexibility of sketching on my Yiynova Tablet Monitor. I was instructed to keep colors to a minimum to save on printing costs, so in the next step where I start adding more details and color, I visualize in my head “BLACK BLUE RED GRAY” (ok well underbase, detail white) as I block in the color. At this point I rough out my background, and add vector elements like their logo. (FYI – when printing on dark t-shirts, you need an underbase for the color to lay down on, and a detail white to really pop out your art – especially if it’s a white truck – so this is actually a 6 color print). Tow Times had a couple changes, but they were minimal and I was able to move onto final vector artwork. Here is the final layout! Yo Kristina nice work, your getting better as time goes on. From all the renderings you have done for me, this project screams awesome. Very cool and interesting stuff!